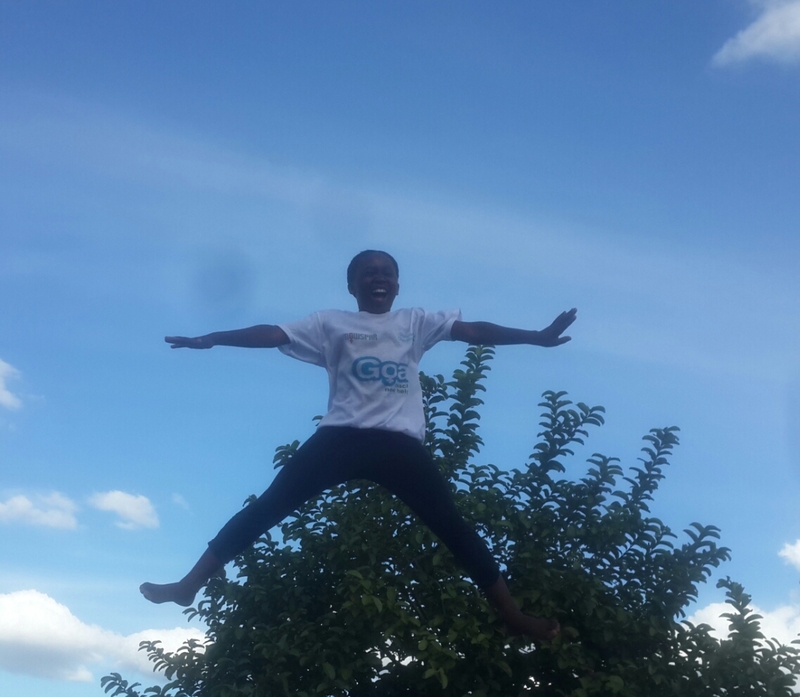 On Thursday 21st August 2015, NOWSPAR conducted a Goal Event at City of Hope Orphanage in Lusaka’s Makeni area. The event had 73 participants of which 52 were girls and 21 were boys all aged between 10 and 20. In attendance were 4 NOWSPAR staff and 1 volunteer as well as the staff and volunteers of City of Hope Orphanage. The aim of this event was to provide an introduction to the Goal Programme to the children and staff at City of Hope Orphanage. It is intended that this partnership between City of Hope and NOWSPAR can result in regular opportunities for the children and the staff to develop their sport and lifeskill program. The event started with a brief introduction of NOWSPAR and the Goal programme which was done by Fatima. The participants took part in warm up sessions which was then followed by fun games that were aimed at having everyone introduce themselves. The girls and boys were then split into two groups with one of the groups playing zigzag saving and the other group playing peace path. The games were followed by life skill empowerment sessions were the participants were taught on hygiene and financial literacy. One of the participants Luke Banda said, “it is important for girls to take part in sport because they also need to enjoy like the boys“. One of the City of Hope volunteers Ichi said, “girls and boys were excited to receive visitors from within Zambia as they mostly receive foreign visitors“. One of the participants Joyce said she was very happy to have participated in the event and she enjoyed playing games and she hopes NOWSPAR will come back and do more activities like this. 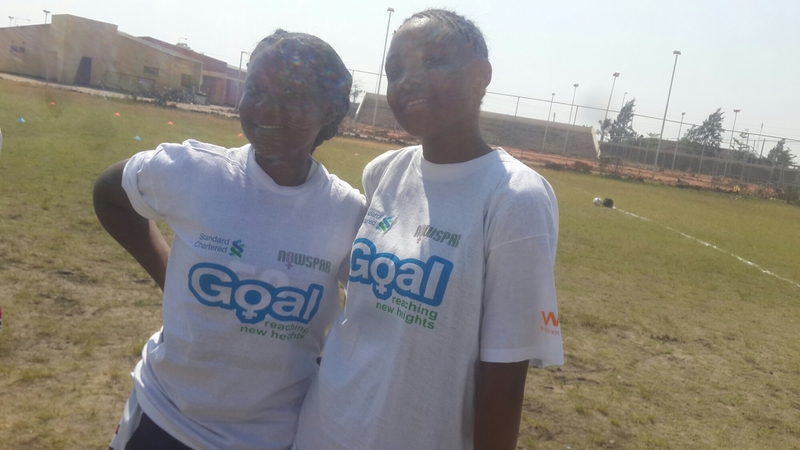 IWD2015: Goal Girls Make It Happen! Liseli Manjata 9 year old. 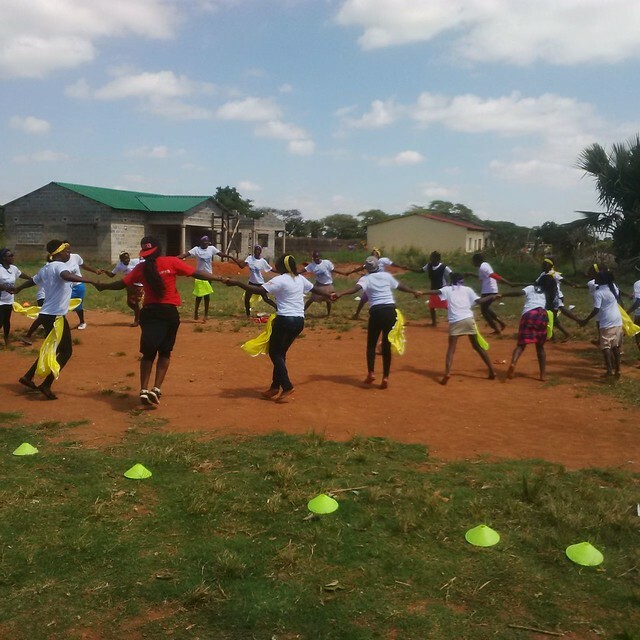 We held our 8th Annual Women’s Sports Day on 7th March 2015 at the National Sorts Development Centre (NASDEC) with over 300 girls and women participating in sport, dance and financial literacy sessions. The theme of the celebration was ‘Gender is a Sports Agenda’ in order to highlight the importance of addressing gender issues within and through sport. 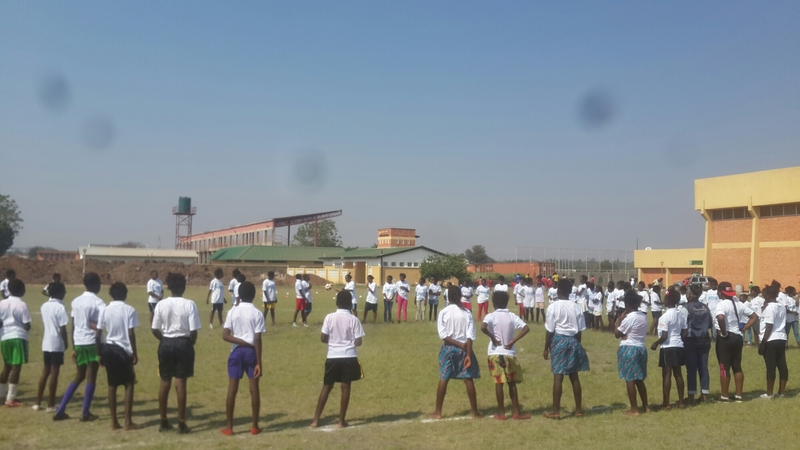 This year, we hosted the Women’s Sports Day in partnership with the National Sports Council of Zambia (NSCZ), we have done this before but for the first time the NSCZ provided the majority of the funding to implement this event, a step forward in getting activities for girls and women funded by our government. 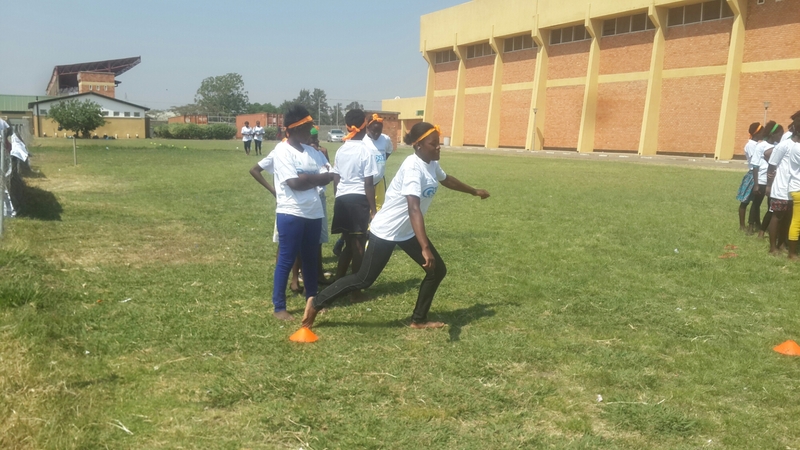 The event was organised by a working group led by the NSCZ Gender Committee and made up of NOWSPAR, Judo, Netball, Badminton, Handball, Squash, Lifeskills Foundation and Bauleni United. 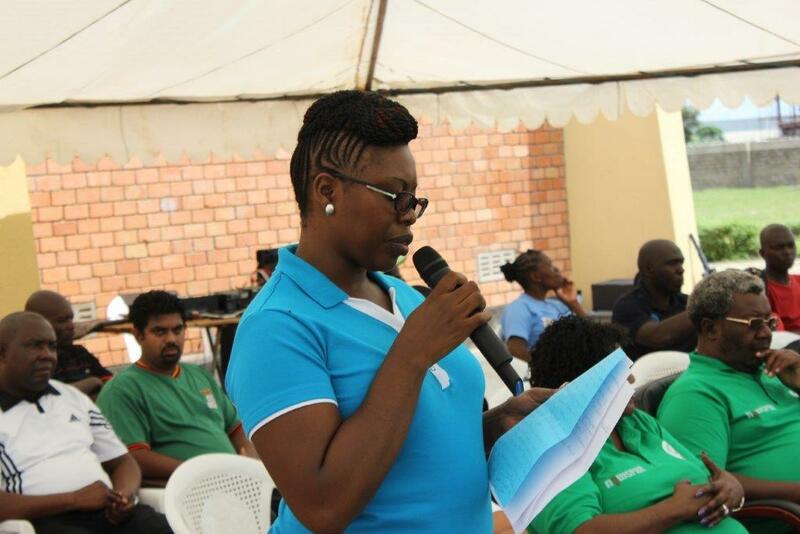 Our Goal Leader Mbachi Nyirenda presented a speech in which she asked the Ministry to address five priorities that the Ministry of Sport should focus on including access to resources, media coverage, leadership, protection and accountability for sport resources. Mbachi has been a part of Goal for over a year. In his speech, the Deputy Minister of Sport, Hon. Chitobela M.P committed to ensuring resource allocation to sport and to addressing the issues raised by Mbachi. The Minister also participated in the various activities including Aerobics, Tug of War and Tai Chi. The event included high energy activities including Aerobics and Zumba Fitness as well as low intensity activities such as Tai Chi. We also had Judo, Tug of War, Squash, Handball, Football and Netball. Some of the girls on these teams also participated in the Goal Event. 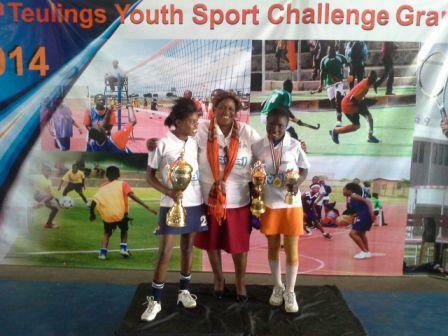 The National Sports Council of Zambia Gender Committee Chairperson Ms. Matilda Mwaba (also our Executive Director) urged all sport Associations to ensure they develop their programs to include girls and women at various levels and positions. During the Goal activities, the participants played games that are based on sport and traditional games as well adapted to provide a learning experience as well as fun and physical movement. The Aerobics Mania session was run by the Divine Style Fitness to demonstrate how each one can be active individually or as a group. 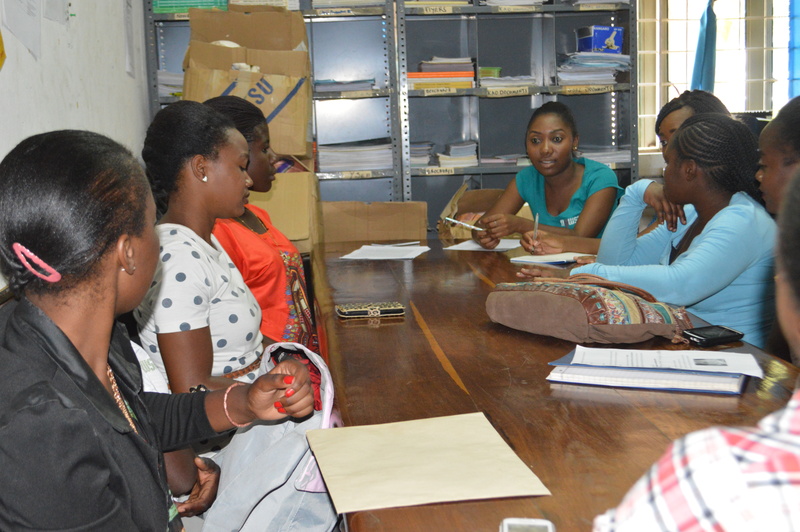 Our Goal Facilitators held Financial Literacy sessions in which 186 girls between 10 and 20 years old participated. 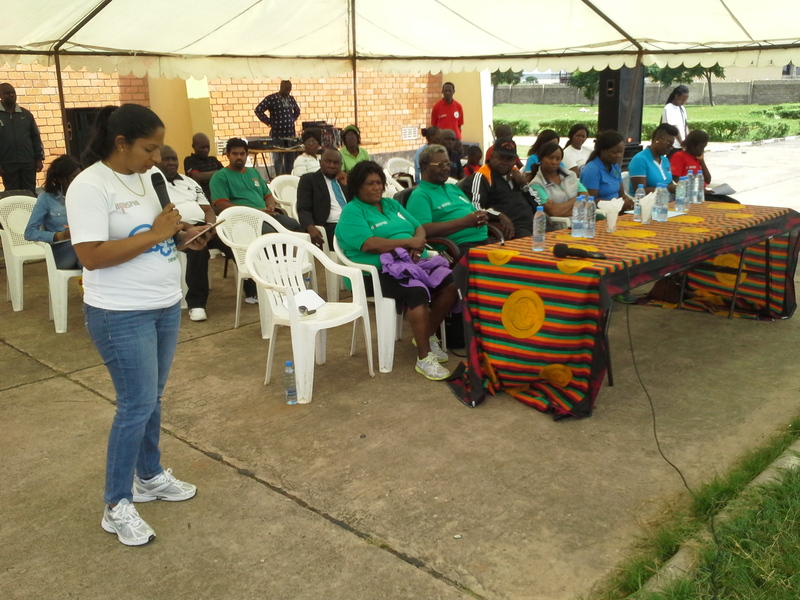 We had 5 staff from our partner Standard Chattered Bank participating in the games and also leading discussions. Standard Chattered Bank Head of Country Legal and Company Secretary Celine Nair spoke at the opening ceremony highlighting the Banks commitment to invest in reaching 500,000 girls globally. The staff of SCB were also a part of the Facilitators’ Training held on 3rd to 5th March where 27 young women were in a training for Goal Facilitators. During the year, staff will volunteer at trainings, events and mentoring opportunities as part of support to NOWSPAR with our partner WomenWin. We partnered with the Securities and Exchange Commission (SEC), the Regulator of Capital Markets in Zambia, to raise awareness on Capital Markets as a platform for alternative saving opportunities to banking. Nine (9) SEC staff participated in the physical activities and play sessions with the girls and young women, playing games to present financial information. Some discussions included barriers to accessing financial institutions such as banks, the concept of shares, short term and long term saving and about SEC as a Regulatory Institution. Speaking during the Opening Ceremony, Ms. Mutumboi Mundia, Director of Market Supervision and Development commended NOWSPAR for implementing the Goal program saying the principles of sports discipline can be applied to achieve personal financial fitness a fundamental element of economic empowerment. We also had fun dancing and for children jumping on the Trampoline and Jumping Castle. This kept the children active while parents played sport. By the end of the day we had about 300 girls and women take part, these came from sport associations, sport NGOs and the defence services. 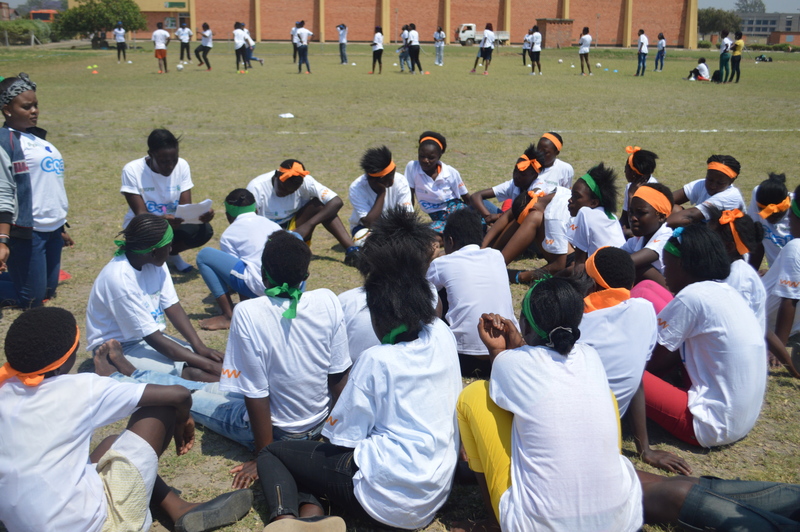 We had organisations present that are part of the Sport for Social Change Network (SSCN Zambia), Kicking AIDS Out and the Girl Power Alliance. 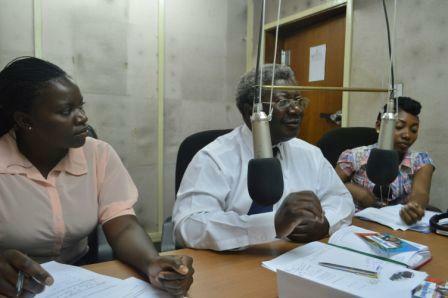 Several media institutions where present including the national broadcaster ZNBC TV, Radio and various Newspapers. 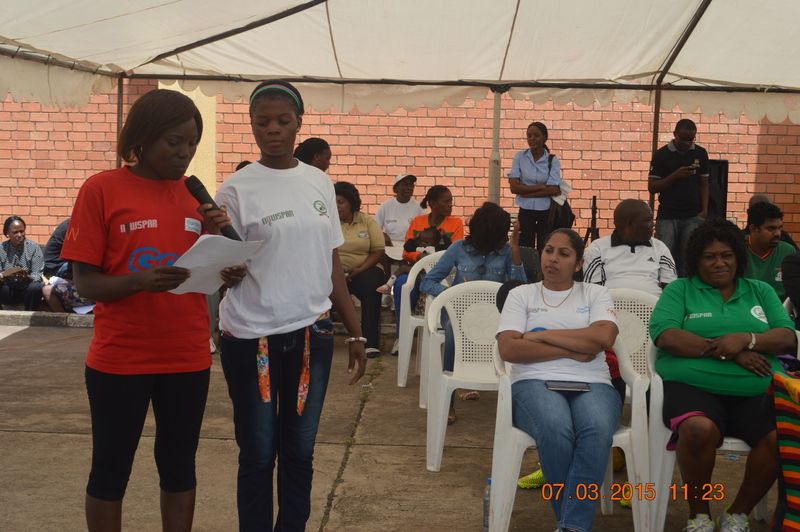 Interviews were conducted with both participants and officials at the event. We anticipate several articles and broadcasts this week and beyond. Through the Girl Power Alliance, our partner the Kilimanjaro Film Institute documented the event and will be producing a video, we look forward to sharing it with you. 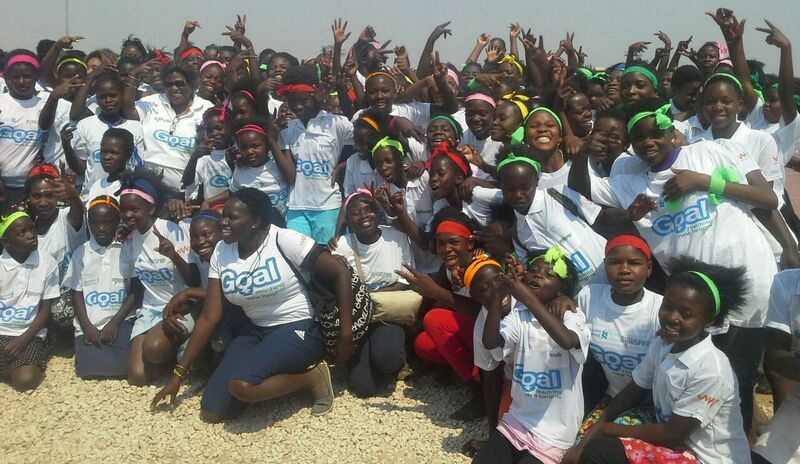 Over 300 adolescent girls gathered at the Olympic Youth Development Centre to participate in our Goal Event in celebration of International Day of the Girl Child on 11th October 2014. The Theme ‘Empowering Adolescent Girls: Breaking the Cycle of Violence’ reflects the aim of the Goal Program that has sessions covering financial literacy, prevention of violence, rights and health. The Goal Event participants were drawn from various sports associations including Handball, Volleyball, Basketball, Hockey, Martial Arts, Boxing, Football among others. During the day, various sport stakeholders visited the event including the Ministry of Sport Permanent Secretary, IOC International Development officer, President of the National Olympic Committee and Patron of the Tuelings Award. Goal Program was recognized and awarded a trophy for the Best Program on Youth Empowerment at the Tuelings Awards held on the same day by the Olympic Youth Development Centre. Speaking at the Ceremony, OYDC Executive Director Mr. Clement Chileshe said the Goal Program was important to meeting the needs of young people and to the fulfillment of the mission of the OYDC. 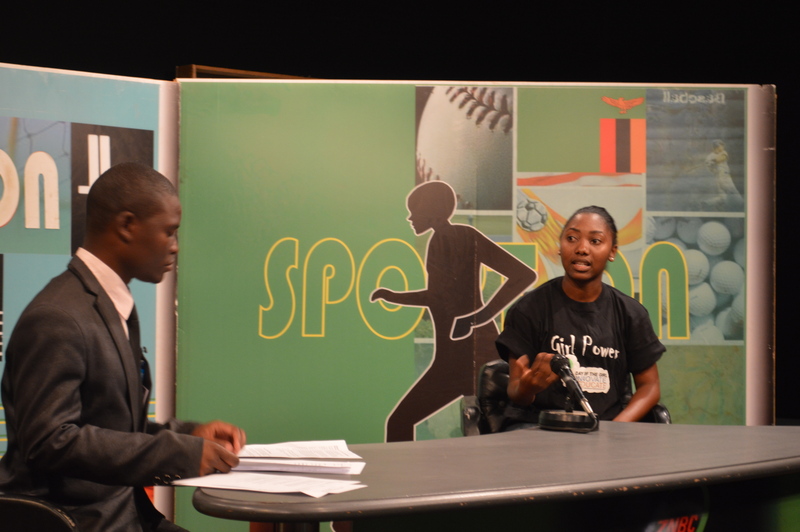 During the week leading up to the event several media discussions were held discussing the role of sport in girls empowerment, how Goal works and to highlight the IDGC Goal Event. NOWSPAR staff were featured on News programs, Talk Shows, Sport Programs and Magazine programs in English, Lozi, Bemba and Tonga on National TV, national and community radio stations. 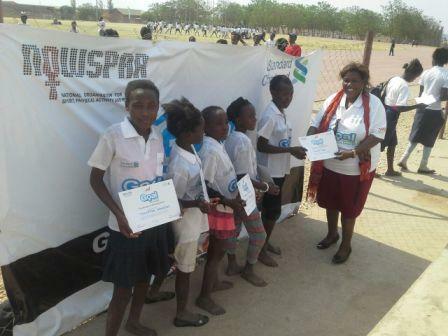 NOWSPAR is supported by Women Win and Standard Chartered to deliver Goal and this year has reached over 1,000 adolescent girls in schools and sports clubs. 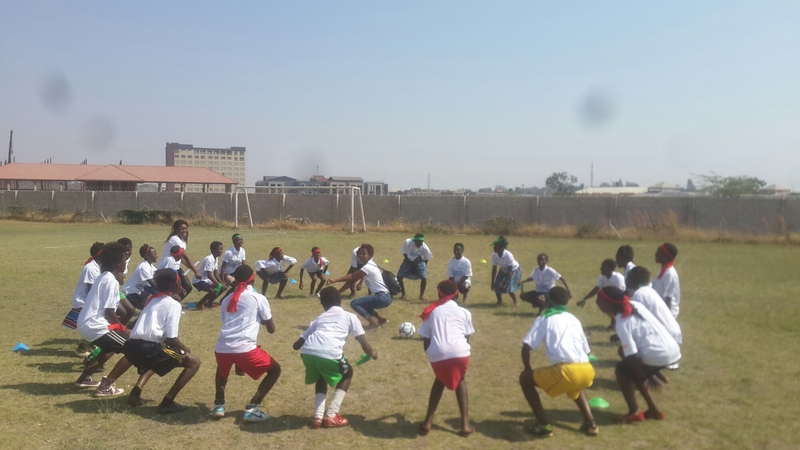 Goal Event with participants from Handball, Basketball and Football Clubs in Lusaka.